Update: Findings are shared here. You might know the user profile and settings. It’s what appears after you click on your profile picture. Maybe you come here to track your Q&A activity or to update your Developer Story. Maybe you’ve stopped by to manage your email settings, opt-in to Beta features, or to get valuable flairTM. Maybe you've even checked out your Stack Exchange network profile. Maybe you've never done any of this, and are learning for the first time about the various things you can do in this mysterious pocket of Stack Overflow and Stack Exchange. The truth is, the user profile and settings have become an increasingly cluttered junk drawer in the last few years. It’s fallen by the wayside against other priorities, and the result is an area that serves many purposes, yet doesn’t serve any one purpose particularly well. With the launch of Teams, we have yet another set of use cases that the profile & settings has to serve, and it does so in a mediocre fashion. We want to change that. 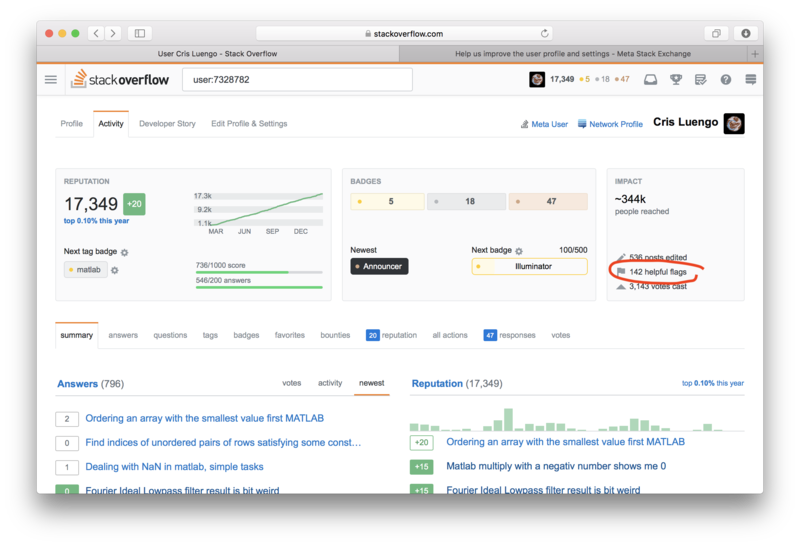 Not just because Teams needs a better profile, but because Stack Overflow and Stack Exchange have needed a better, fully responsive profile for a long time. We’re kicking off these changes by conducting user research about what people like and dislike about the profile, and how it might be improved. In addition to the folks on Meta, we’ll be talking to people sourced from our Research email list. The intent is to get some preliminary knowledge about what kinds of updates would be most beneficial to the most people. Imagine you could have one unified profile vs. many unique profiles. Which would you prefer, and why? We recognize that Meta folks are probably more likely to use the profile and settings regularly, which is why you’re one of the first groups of people that we’re talking to. Please fill out the survey by Thursday, December 13. I think the profile is actually one of the most well-thought-out parts of Stack Exchange already, and I'd question whether it actually needs much changing. I can certainly see the argument for wanting to get Teams to feature in profiles, but I'd much rather see that get worked into the existing profile in some of the free space somewhere than a whole new profile page get built. That would be effort that could be better spent on areas of SE more in need of attention - there's plenty to choose from. There are potentially other spaces on that page as well - under the list of stats in the right sidebar, maybe, or on the Activity tab - etc. Please bear in mind that of the 174 sites on the network, only one has either Developer Story or Teams (and SE has no plans to change that). While SO is a massive site and deserves a lot of attention, it's important to not downgrade the experience on all the other sites while making improvements needed by these extra tie-ins. I'm pretty satisfied with the existing profile, as ArtOfCode said in another answer. It'd be nice to have an easier path to the Team I'm part of – having it show up in the accounts list on my network profile (just for me) would be great! – but that's a nice-to-have, not essential. I filled out the survey (thanks for asking!) and left more-detailed feedback there; I'm posting here because it sounds like SO-only concerns are driving this, we've seen that before, and I'm hoping we'll be careful. Thanks. I echo the other answers, the user profile is pretty good, it just needs to adjust to smaller screens better. There is however one thing that could be improved in the user profile, or added elsewhere: I need to select the "Activity" tab, then click on "x helpful flags" in the small version of the user activity summary to get to the page where I can see what happened to the flags I raised. This needs to be in an easier place to discover. I wouldn't be surprised if many users never see the feedback about declined flags etc. Flags could, for example, be one of the tabs on the activity tab, next to "votes". the reputation does not even reach all the way back to the beginning of the user's join date (2013 for me). Unfortunately, though, this is a different type of graph and so it's not easy to tell at a glance where a user was, rep-wise, at a given date in time. What does the number next to favorites mean? What does highlighting mean on the profile's "Favorites" tab? What does the number on the favorites tab mean? Here there are five links with five different suggestions as to what the number indicates. Maybe it indicates a sensible list of things that have changed, but that needs to be reflected in the questions that are highlighted and there should be a tooltip when you hover over the number that indicates what it includes. would be super useful (we can't always remember why we favorited stuff days/weeks/months/years later), but what would make this a killer profile page feature is the ability to search, sort, and filter our favorites list. I'm talking a full search - title names, author, what tags are included, etc. (bonus points if you can make it search within the body of the posts, but I know that's quite a bit more effort). We can already sort of do this in a roundabout way by going to the main page and using the infavorites:mine parameter, but it'd be great to be able to search within the profile page itself. Is there any way to favorite/bookmark an answer? Is there a way to create a separate favorite list of my own answers? Include pagination links at the top of the Favorites list as well as the bottom. Please don't make any big changes! I like the SE profiles. The flow is logical and compartmentalised; the organisation works well for me. If I want to check up on rep, I can go to the reputation tab with one click. If I want to see reviews I have completed, I can browse through them without too much distraction. For the same reasons I opt for separate profiles for each site. I like to have everything in separate "areas". The current profiles are almost integrated already, anyhow; if I want to check up on another profile, it is only a click away, in the menu. However, it is a real pain to have to log in to all sites individually. For security reasons I clean cookies regularly, which forces me to log in to every profile. If logins were network-wide I would be happy. Yes, by design. Compared to other requirements, the profile should not be re-prioritized. It serves no increased purpose, and several previous improvements requiring investment didn't really change much. While there are several areas which could be developed, they simply should not. There are other priorities which need to remain prioritized. Revision history for "about" text. The text in the "about" box can be substantial. We have 3000 characters, which is the size of some posts. People edit this text from time to time; it's not always "write once and forget". And we can (and do) customize it for each site, highlighting things relevant on that site but not on others. And it can all be lost with one accidental update that you meant to only do on one site. I shouldn't have to manually back up these quasi-posts off-site. Could we please have a way to access the revision history (like for posts) on our own "about" text? Don't expose it to other users; like email address, it's just for the owner (and moderators). "A long time" is relative: the profile got a full overhaul about three years ago. There are many other items users have asked for that are longer outstanding. In my opinion, the profile page should not be considered a priority; there is nothing significant that is broken or missing, especially compared to other features. The hobbled Network level profile makes my life difficult. Sites are different. SO has some different features that other sites don't have and not everything will make sense for the whole network. A profile on a site may look and feel different than a global Network profile. They may have different use cases or audiences. Different people have different expectations for a profile. On a number of sites, I consider myself an expert and participate almost exclusively to share answers. On other sites, I am a learner and tend to ask questions. On one site, I'm a moderator. There may be others, but these people probably want to show off different stuff in a profile. One thing I like about the old StackExchange mobile app (I use it on iOS) is it lets me click my avatar to see all my recent activity. This includes questions, answers, and comments. This is really useful for keeping tabs on several Q&A threads I'm participating in, on different sites, all in one place. In the current web experience, I have to click my site profile, click "Network Profile", then click the "Activity" tab, and sometimes the "all" subtab. That's a long distance to go when I'm using the listing to navigate back and forth between different threads. I'd like it if the proposed responsive design gave me quick access to the "all the things I'm doing across the network" list from any site, with one or two clicks. For example, having 150+ profiles across network sites, and it's impossible to edit them from one place (or in some easily to use method). You can only copy your profile to all sites, however it's not possible to manage profiles without logging to all of these 150+ sites individually (which can result in IP ban). This isn't possible using API as well, since About me field isn't supported. So, please improve how users can edit multiple profiles across the network. Or at least add such ability to API, so users can create apps to do that. How can I edit my network profile independently? Ability to sort UP or DOWN when sorting questions or answers by votes, activity, or newest. Currently it just sorts highest/newest to lowest/oldest. 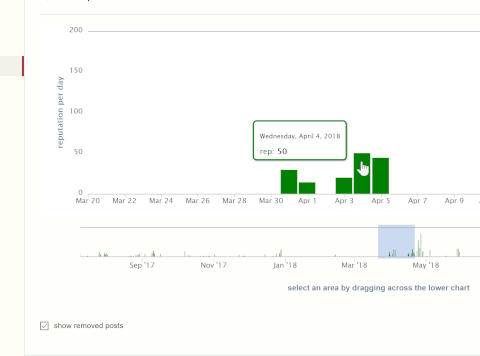 Being able to change the x-axis range of the reputation graph at the top of the activity tab. It'd be nice to change this between weekly, monthly, the 9 mo default, and yearly. Why not squeeze Track my next privilege and Track a tag badge instead to both be visible at once? Enable profile picture enlargement when clicked on. Why not move the list of communities a user is active in over to the empty space on the left side bar? In fact, I can add my job title and employer to my Stack Overflow profile, but not to any other profile. (I use Stack Overflow, Meta Stack Overflow, Super User, and Meta Stack Exchange.) Please allow us to add our job titles and employers to our other site pages. My problem is that the size of questions page and user profile page are not the same. That is, when I change my browser zoom to 150%, I see all the contexts in the questions page, but I don't see a thin part on the right of profile page. This is probably a general problem in the design of all stackexchange sites. At a minimum, please, please, please* add a prominent "log out" button. The one tucked away under the "site switcher" icon (which I had no idea was called that until I just looked at the html) is just too hidden. "What is the best way to manage logging in/out of StackExchange sites without going insane?" So, I've been using this site I-don't-know-how-many-years now and I still cannot figure out how logging in and logging out, or joining Stack Exchange and or its various sites works, and sometimes wonder even if these are a meaningful concepts. So for me, a "casual user" (but still in like the stop 2%-16% on some rather prominent communities), the answer is unquestionably one unified profile. I eventually thought the better of posting my "question", but I spent maybe three hours writing it. It basically came down to what I think you're asking. I could post more of it if you wanted, which basically just breaks down why I find the fragmentation so frustrating and confusing, and how I think its a major turn off to other "casual users", and drives them to places like Quora instead. 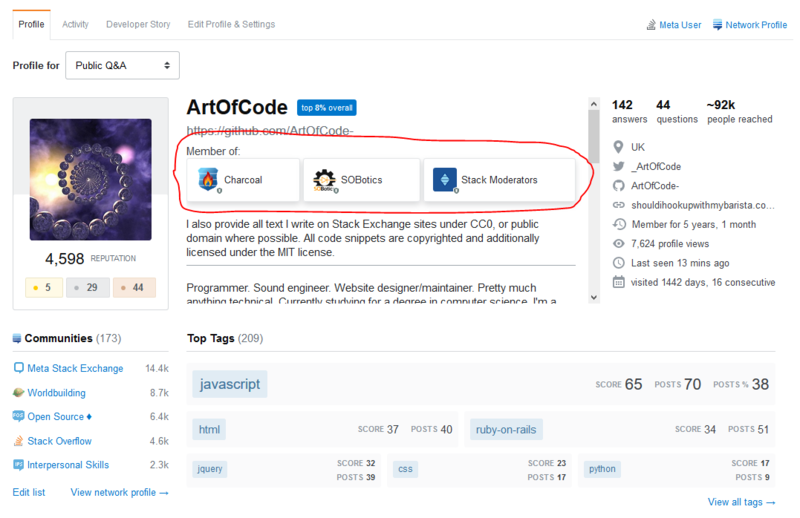 I think you might find more evidence supporting that general users want more "integration" if you dig around here, for example: Why am I not logged in to all of my communities when I log into StackExchange? I would say that that question was completely incorrectly marked a dupe. I very much read that question, not a question of why (by what means is this happening)—but much more why (for what cause is it such). For example, here in the tooltip and why not in the "post" and "time" tabs. Monica's answer and Thomas's answer has some valid points why a common profile might not look good. In addition to that I would like to add that, having a common place for settings would be great. Keep profile separate for each site and provide a unified settings page. Something related to the Winter Bash opt-out/opt-in: for those who prefer to NOT participate in it, they have to repeat, each year, something like "I do not like hats". Because by default, every year, the hats are enabled. And to actually disable the Winter Bash hats, they have to wait until the Winter Bash period has started. Which puts them at risk that they already earned hats before they noticed the Winter Bash period has started. If you'd move that option to a permanent profile option, then you could remember that preference for subsequent years. Whereas by default, for new users, you could still have the hats enabled. The “about me” section needes to be changed. Add a “Showcased Questions and Answers” section to the about me to show off your best or favorite questions and answers. Add a “Chatrooms” section to show what rooms you participate in. Add a “Recommended Reading” like thing (in the developer story) to the about me. However they don’t have to be synced to the dev story. Also, the dev story does not have to be made, so it would work for non-SO sites. Add a way to show off previous Winter Bashes. Add a way to show off leaderboard rankings. Add the ability to move around these new sections relative to each other and the block of about me text. Can we extend the 3000 character limit in the about me section of the profile to 5000 characters or more? I want to be able to add more to my profile. Of course all of these do not have to be added. The bounties tab contains links to questions. That makes sense for active bounties, but for awarded and received bounties I think it would make more sense to link to the answer. ...make the main SE profile seem like less of a ghost town—more "share-worthy"
...and more linked social accounts in "Web presence"
Desktop browser User Profile and Settings page is much overloaded with info but the Mobile browser view still lacks much user specific info. Not the answer you're looking for? Browse other questions tagged discussion profile-page . What does highlighting mean on the profile's “Favorites” tab? Can users opt back in to the Winter Bash after clicking “I hate hats”?